Those who travel to North Korea regularly might have noticed that the last couple of years have brought significant improvement in the country’s economic situation. Newly built high-rise apartments, modern cars on the roads and improved infrastructure come as a surprise to visitors. It begs the question, where does Pyongyang get the money from? The ambitious rocket and nuclear programs, which North Korea continues to pursue despite international condemnation, are expensive and harmful to its economy. International sanctions continue to bite the Democratic People’s Republic of Korea’s foreign trade and investment prospects. Regular floods and droughts, animal epidemics and other natural disasters hit the fragile economy even harder. According to expert estimations, the DPRK should have ceased to exist in the mid-1990s, after the Communist Bloc collapsed and Kim Il-Sung died. But North Korea has fully recovered after the famine and even shows steady signs of economic growth. Foreign critics looked everywhere with hope to unravel the mystery. After 2008, the stalled inter-Korean cooperation left North Korea without South Korean financial assistance. Western humanitarian aid has also been exhausted or reduced to a number of goods with little market value. Although the volume of North Korea’s foreign trade is negligible, the domestic economic situation continues to improve. Pyongyang is routinely suspected of violating international sanctions by trading arms, smuggling drugs, counterfeiting US dollars and other crimes. These activities would be expected to refill the impoverished state with badly needed foreign exchange. However, anti-proliferation operations and bank account arrests have never disclosed anything criminal nor did they manage to answer the main question: where does the money come from? In fact, North Korea is sitting on the goldmine. The northern side of the Korean peninsula is well known for its rocky terrain, with 85% of the country composed of mountains. It hosts sizeable deposits of more than 200 different minerals, of which deposits of coal, iron ore, magnesite, gold ore, zinc ore, copper ore, limestone, molybdenum, and graphite are the largest and have the potential for the development of large-scale mines. After China, North Korea’s magnesite reserves are the second-largest in the world, and its tungsten deposits are almost the world’s sixth-largest. Still the value of all these resources pales in comparison to prospects that promise the exploration and export of rare earth metals. Rare earth metals are a group of 17 elements found in the earth’s crust. They are essential in the manufacture of high-tech products and in green technologies, such as wind turbines, solar panels or hybrid cars. Known as “the vitamins of high-tech industries,” REMs are minerals necessary for making everything that we use on a daily basis, such as smartphones, flat-screen TVs, and notebook computers. 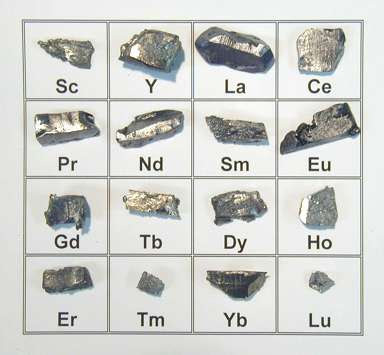 Some rare earth metals, such as cerium and neodymium, are crucial elements in semiconductors, cars, computers and other advanced technological areas. Other types of REMs can be used to build tanks and airplanes, missiles and lasers. South Korea estimates the total value of the North’s mineral deposits at more than US$6 trillion. Not surprisingly, despite high political and security tensions, Seoul is showing a growing interest in developing REMs together with Pyongyang. In 2011, after receiving permission from the Ministry of Unification, officials from the Korea Resources Corp visited North Korea twice to study the condition of a graphite mine. Together with their counterparts from the DPRK’s National Economic Cooperation Federation they had working-level talks at the Kaesong Industrial Complex on jointly digging up REMs in North Korea. An analysis of samples obtained in North Korea showed that the type of rare earth metals could be useful in the manufacture of liquid crystal display (LCD) panels and optical lenses. The joint report also revealed that there are large deposits of high-grade REMs in the western and eastern parts of North Korea, where prospecting work and mining have already begun. It also reported that a number of the rare earth elements are being studied in scientific institutes, while some of the research findings have already been introduced in economic sectors. The North built a REM reprocessing plant in Hamhung in the 1990s but has been unable to put the plant into full operation due to power and supply bottlenecks. Rare earth minerals are becoming increasingly expensive, as China, the world’s largest rare earth supplier, puts limits on its output and exports. In February, China’s exports of rare earth metals exceeded the price of $1 million per ton, a nearly 900% increase in prices from the preceding year. China, which controls more than 95% of global production of rare earth metals, has an estimated 55 million tons in REM deposits. North Korea has up to 20 million tons of REM deposits but does not have the technology to explore its reserves or to produce goods for the high-tech industry. Nevertheless, in 2009 the DPRK’s exports of rare metals to China stood at $16 million, and as long as someone invests, exports will continue to expand. This growing rise in REM prices and strong demand gives the young leader Kim Jong-Un a good chance to improve the economic standing of North Korea without actually reforming its economy. Following the Gulf States’ and Russian example of catching the wind of rising oil prices in their sails, Pyongyang is likely to follow suit, becoming rich and powerful through the exploration and sale of natural resources. The export of rare earth metals will replenish the state coffers; stimulate the loyalty of the elites to Kim Jong-Un’s autocratic rule; and secure the growth of consumption among the ordinary people. Relations with South Korea, China and Japan are also likely to improve due to the large scale cooperation on exploring, processing and utilizing REMs – the mineral of the 21st century. Pyongyang needs international assistance through joint projects to explore its mineral resources, and mainly its rare metal and rare earth minerals. North Korean and Chinese teams have been cooperating to explore mineral resources in the DPRK for many decades. Seoul has recently expressed interest in working with Pyongyang on mining projects and technological innovations. Perhaps, Japan and Taiwan, which look for alternative REM supplies for their micro-processor and other cutting edge industries, might also decide to contribute to the development of this economically promising venture. Paradoxically, the promise of Kim Jong-Il might soon come true and North Korea may become a “rich and powerful state” – rich in natural resources and empowered by nuclear technologies. In that case, North Korea might not even need to go through a painful and potentially destabilizing economic reform. Although the political regime will remain dictatorial, the idea of unification with the South by war or absorption will soon become meaningless. The purges of political elites and the mass starving of ordinary people in North Korea will cease. Gradually the level of prosperity in the two halves of the divided Korea will start equalizing, opening more opportunities for greater exchange and cooperation. SRE Minerals Limited (“SRE” or “the company”) announced today their joint venture agreement with the Korea Natural Resources Trading Corporation for rights to develop all rare-earth-element deposits at Jongju, North Pyongan Province. The joint venture company known as Pacific Century Rare Earth Mineral Limited has the rights under the joint venture agreement which includes the exploration, mining, beneficiation and marketing of all REE deposits in the Jongju area for the next 25 years with a further renewal period of 25 years. Under the terms of the JV agreement SRE has also been granted permission for a National Rare Earth Mineral Processing Plant on site at Jongju, which is situated approximately 150 km north-northwest of the capital city of Pyongyang, within the North Pyongan Province, Democratic People’s Republic of Korea. Leading Australian mining and geological consultancy, HDR Salva Resources Pty Ltd, has been SRE’s technical representative for the project and has been commissioned to access the mineralised potential of the Jongju REE target* with special reference to detailed mapping, extensive trenching and limited drilling. • 3.63 Bt @ 1.35% TREO. Technical information in this announcement has been compiled by Dr Louis W. Schurmann, who is a Fellow of the Australasian Institute of Mining and Metallurgy and a Professional Natural Scientist with over 18 years of experience relevant to the styles and types of rare earth mineral deposits under consideration, and to the activities which has been undertaken to qualify as a Competent Person as defined by the Australasian Code for Reporting of Minerals Resources and Reserves (JORC) 2004. Dr Schurmann consents to the inclusion of information in this publication. Further exploration is planned to recommence in March 2014, which will include 96,000m (Phase 1) and 120,000m (Phase 2) of core drilling. Results from the exploration program will be reported according to the Joint Ore Reserves Committee of The Australasian Institute of Mining and Metallurgy, Australian Institute of Geoscientists and Mineral Council of Australia (JORC Code (2004 / 2012)). Investigations by the DPRK’s Academy of Science geologists have also identified several HREE targets*. There are also seven newly discovered carbonatite complexes which have been identified as green-field exploration targets. Exploration programs have been planned to assess their potential in 2014, together with the evaluation of known bastnasite and monazite deposits. According to the mentioned HDR Salva Resources’ assessment, the Jongju REE Target* also contains economical quantities of rare and critical metals associated with fluorite, apatite, zircon, magnetite, ilmenite, nepheline and feldspar. These commodities will also be addressed during future exploration and further studies. “This joint venture agreement reinforces the strong and constructive relationship SRE has developed with the DPRK over that time,” he said. In terms of back ground, the majority of rare earth elements were sourced from placer deposits in India and Brazil in 1948. During the 1950’s, supply came mainly from South Africa, mined from large veins of rare earth-bearing monazite. Then from the 1960’s to 1980’s, rare earths were supplied primarily from the U.S., predominantly from Mountain Pass in California. Competition from China and environmental concerns eventually saw the U.S. operations shut down, and for the last 15 years China has dominated global supply. China today supplies an estimated 90-95% of the global market. China has recently set quotas to restrict its rare earth exports, and global suppliers have made considerable headway in reducing dependence on Chinese supply. Based on this, several major rare earth companies have been taking advantage of this situation while many junior exploration companies have embarked on exploration programs to add value to small and relatively low-grade REE occurrences. References to Exploration Target(s)* or Target(s)* in this document are in accordance with the guidelines of the JORC Code (2004). As such it is important to note that in relation to reported Exploration Targets or Target any reference to quality and quantity are conceptual in nature. Exploration carried out to date is insufficient to be able to estimate and report rare-earth mineral resources in accordance with the JORC Code (2004). It is uncertain if further exploration will result in the determination of a rare earth mineral Resource.